1.1.1.1 – Why a WAN? 1.1.1.2 – Are WANs Necessary? Students should complete Chapter 1, “Assessment” after completing Chapter 1. Explain WAN access technologies available to small to medium-sized business networks. Explain the purpose of a WAN. 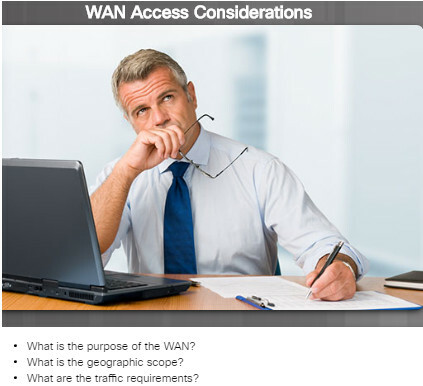 Select WAN access technologies to satisfy business requirements. 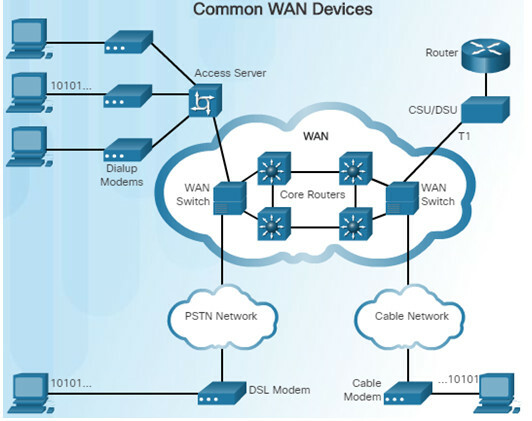 Select the appropriate WAN protocol and service for a specific network requirement. A WAN operates beyond the geographic scope of a LAN. WANs are used to interconnect the enterprise LAN to remote LANs in branch sites and telecommuter sites. A WAN is owned by a service provider whereas a LAN is typically owned by an organization. An organization must pay a fee to use the WAN service provider’s network services to connect remote sites. Service providers provide links to interconnect remote sites for the purpose of transporting data, voice, and video. 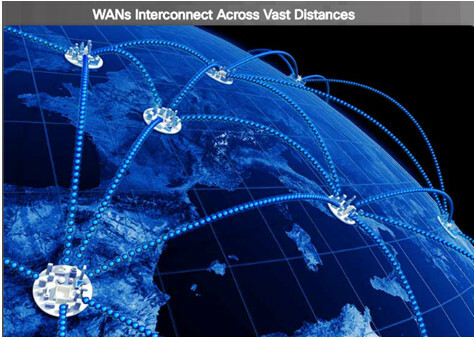 Without WANs, LANs would be a series of isolated networks. Organizations need to share information with other customer organizations. Employees who travel on company business frequently need to access the corporate network. In addition, consumers now commonly communicate over the Internet with banks, stores, and other providers of goods and services. Interconnecting multiple sites across WANs can involve a variety of service provider technologies and WAN topologies. There are four Common WAN topologies. Typically involves a dedicated leased-line connection such as a T1/E1 line. A single interface to the hub can be shared by all spoke circuits. Spoke sites can be interconnected through the hub site using virtual circuits and routed subinterfaces at the hub. 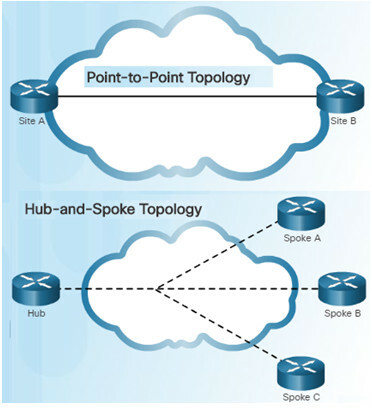 A disadvantage of the hub-and-spoke topology is that all communication has to go through the hub. 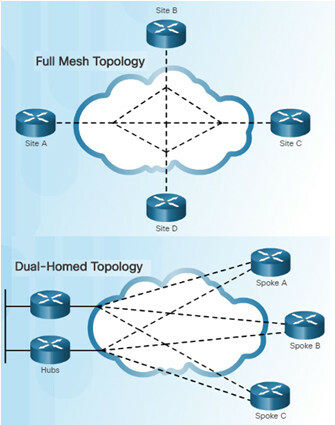 With a full mesh topology using virtual circuits, any site can communicate directly with any other site. A disadvantage is the large number of virtual circuits that need to be configured and maintained. Provides redundancy and load balancing however they are more expensive to implement than single-homed topologies. Requires additional networking hardware including routers and switches. More difficult to implement since they require complex configurations. In slow economic times, many businesses focus on increasing their profitability by improving the efficiency of their existing operations – including establishing and managing their network. To justify such a large expense, many companies expect their networks to perform optimally and to be able to deliver an increasing array of services and applications to support productivity and profitability. This chapter will focus on a fictitious company called SPAN Engineering. This topic will illustrate how SPAN’s network requirements change as the company grows from a small, local business into a global enterprise. Has developed a special process for converting household waste into electricity and is developing a small pilot project for a municipal government in its local area. Uses support services purchased from DSL provider for IT support. Five years later, SPAN Engineering has grown rapidly. The company was contracted to design and implement a full-sized waste conversion facility as well as other projects in neighboring municipalities and around the country. The company is now classified as a small to medium-sized business with several hundred employees. The company now occupies multiple floors of an office building. The network has grown to several subnetworks which spans several floors of the building. The business now has an in-house IT staff to support and maintain the network. Another six years later, SPAN Engineering has been so successful, they have expanded their operation and have opened small branch offices closer to the project sites. The company was required to implement a WAN in order for the remote sites to be able to access the data center which houses various databases and servers. The branch offices that are in nearby cities use private dedicated lines through their local service provider. 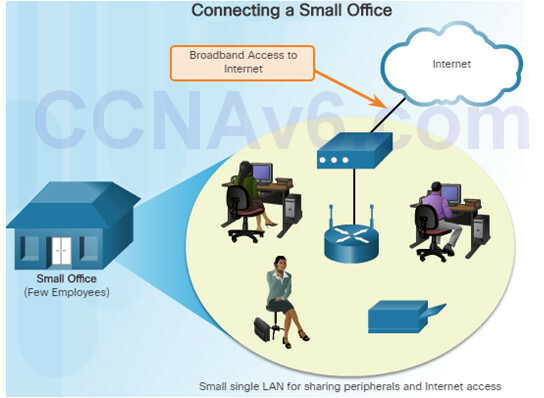 Offices that are located in other countries must use the Internet for their WAN connection. 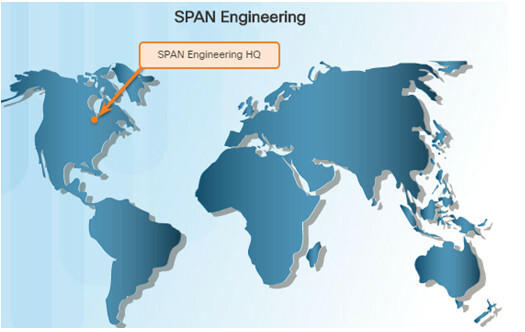 SPAN Engineering has now been in business for 20 years and has grown to thousands of employees distributed in offices worldwide. The cost of the network and its related services is a significant expense. To increase profitability, the company must reduce its operating expense. What methods has the company used to reduce its operating costs? To meet the new requirements, the network must provide the necessary converged service and secure Internet WAN connectivity to remote sites. As seen in this example, network requirements of a company can change dramatically as a company grows over time. Data link layer requirements include physical addressing, flow control and encapsulation. Layer 1 protocols describe how to provide electrical, mechanical, operational, and functional connects to the services of a communications service provider. Layer 2 protocols define how data is encapsulated and the mechanisms for transferring the resulting frames. One primary difference between a WAN and a LAN is that a company must subscribe to an outside WAN service provider to use WAN carrier network services. Data Communications Equipment (DCE) – Also called circuit-terminating equipment, the DCE consists of devices that put data on the local loop. The DCE primarily provides an interface to connect subscribers to a communication link on the WAN cloud. Data Terminal Equipment (DTE) – The customer devices that pass the data from a customer network or host computer for transmission over the WAN. The DTE connects to the local loop through the DCE. Demarcation Point – This is a point established in a building to separate customer equipment from service provider equipment. Local Loop (“last mile”) – The actual copper or fiber cable that connects the CPE to the CO of the service provider. Central Office (CO) – The CO is the local service provider facility or building that connects the CPE to the provider network. Toll network – This consists of the long-haul, all-digital, fiber-optic communications lines and other equipment inside the WAN provider network. Dialup modem – Legacy WAN technology that converts (modulates) the digital signals produced by a computer into voice frequencies which are transmitted over the analog lines of the public telephone network to another modem for demodulation. Access server – Legacy technology where the server controls and coordinates dialup modem, dial-in and dial-out user communications. Broadband modem – A type of digital modem used with high-speed DSL or cable Internet service. Both operate in a similar manner to the voiceband modem, but use higher broadband frequencies and transmission speeds. 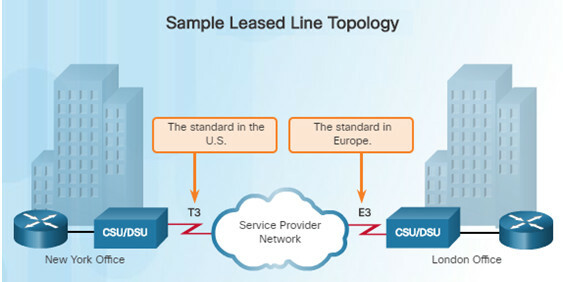 CSU/DSU – Digital-leased lines require a CSU and a DSU. The CSU provides termination for the digital signal and ensures connection integrity through error correction and line monitoring. The DSU converts line frames into frames that the LAN can interpret and vice versa. Router – Provides internetworking and WAN access interface ports that are used to connect to the service provider. Core router/Multilayer switch – A router or multilayer switch that resides within the middle or backbone of the WAN. 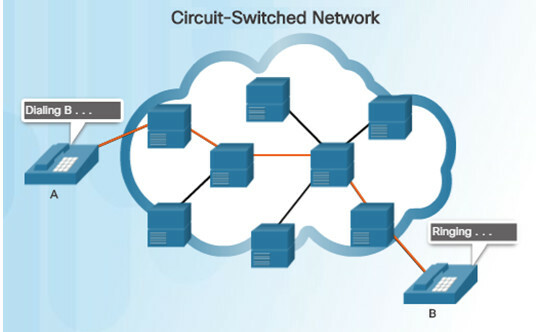 A circuit-switched network is one that establishes a dedicated circuit (or channel) between nodes and terminals before the users may communicate. Circuit switching dynamically establishes a dedicated virtual connection for voice or data between a sender and a receiver. Communication can’t start until the connection is established through the service provider network. Dialing a number to make a call is an example of circuit switching technology. The two most common types of circuit-switched WAN technologies are the public switched telephone network (PSTN) and the Integrated Services Digital Network (ISDN). 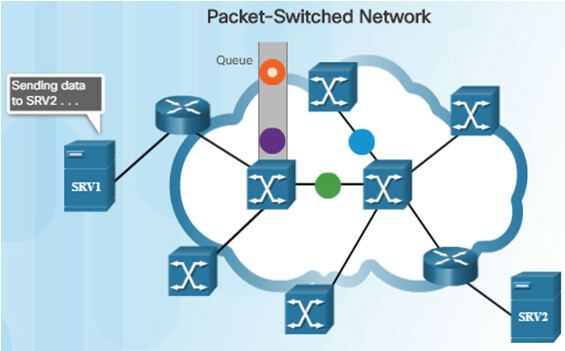 In contrast to circuit switching, packet switching splits traffic data into packets that are routed over a shared network. A circuit does not need to be established and many pairs of nodes can communicate over the same channel. Connectionless systems – Full addressing information must be carried in each packet. The Internet is an example of a connectionless system. Connection-oriented systems – The network predetermines the route for a packet, and each packet only has to carry an identifier. An example of a connection-oriented system is Frame Relay (DLCIs are the identifiers). Packet switching costs less than circuit switching, however, latency and jitter are greater in packet-switching networks. 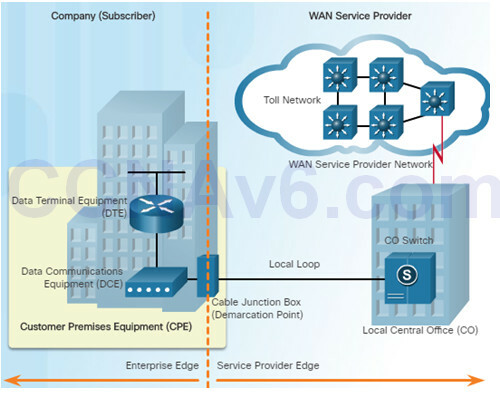 There are several WAN access connection options that ISPs can use to connect the local loop to the enterprise edge. Each option has distinct advantages and disadvantages as well as differences with technology, speed, and cost. Private WAN infrastructure – Choices may include dedicated point-to-point leased lines, circuit-switched links such as PSTN or ISDN, and packet switched links such as Ethernet WAN, ATM, or Frame Relay. Public WAN infrastructure – Service providers may offer broadband Internet using DSL, cable, or satellite access. Data traveling between corporate sites over a public WAN should be protected using VPNs. Service provider networks are complex and consist mostly of high-bandwidth fiber-optic media, using either Synchronous Optical Networking (SONET) or Synchronous Digital Hierarchy (SDH) standard. 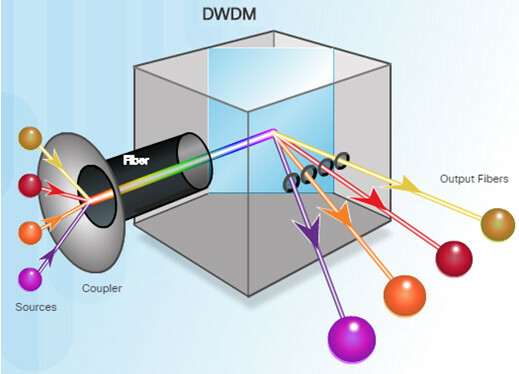 A newer fiber-optic media development for long-range communications is called dense wavelength division multiplexing (DWDM). Leased lines vary in price depending on the bandwidth required and the distance between the two connected paths. In North America, service providers use the T-carrier system to define the digital transmission capacity of a serial copper media link. For example, a T1 link supports 1.544 Mb/s. 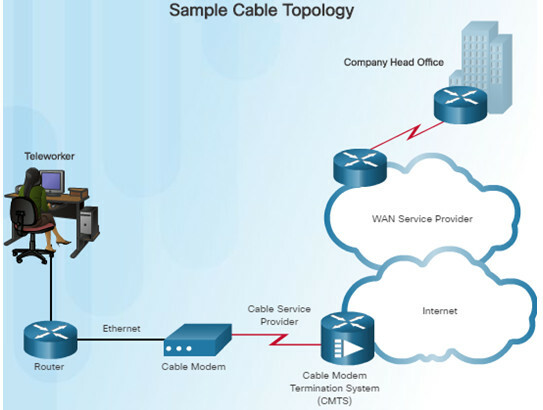 When permanent dedicated connections are required, a point-to-point link is used to provide a pre-established WAN communications path from the customer premises to the provider network. Dialup WAN access may be required when no other WAN technology is available. For example, a remote location could use modems and analog telephone lines to provide low capacity and dedicated switched connections. Traditional local loops, which use copper cabling, transport binary computer data through the voice telephone network using a modem. A modem modulates the binary data into an analog signal at the source and demodulates the analog signal to binary data at the destination. The physical characteristics of the local loop and its connected to the PSTN limit the rate of the signal to less than 56 kb/s. 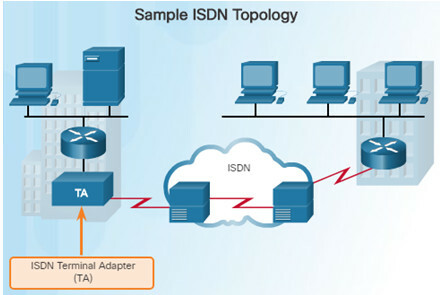 Integrated Services Digital Network (ISDN) is a circuit-switching technology that enables the local loop of a PSTN to carry digital signals, resulting in higher capacity switched connections. ISDN changes the internal connections of the PSTN from carrying analog signals to time-division multiplexed (TDM) digital signals. TDM allows two or more signals, or bit streams, to be transferred as subchannels in one communication channel. The ISDN connection may require a terminal adapter (TA) which is a device used to connect ISDN Basic Rate Interface (BRI) connections to a router. Basic Rate Interface (BRI) – ISDN BRI provides two 64 kb/s bearer channels (B) for carrying voice and data and a 16 kb/s delta channel (D) for signaling, call setup and other purposes. Primary Rate Interface (PRI) – In North America, PRI delivers 23 B channels with 64 kb/s and one D channel with 64 kb/s for a total bit rate of up to 1.544 Mb/s. This includes some additional overhead for synchronization. A common application of ISDN is to provide additional capacity as needed on a leased line connection. ISDN can also be used as a backup if the leased line fails. Although ISDN is still an important technology for telephone service provider networks, it has declined in popularity due to DSL and other broadband services. 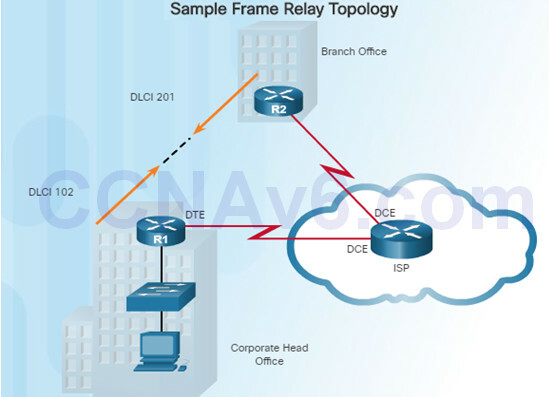 Frame Relay is a Layer 2 non-broadcast multi-access (NBMA) WAN technology used to interconnect enterprise LANs. A single router can be used to connect multiple sites using PVCs which can carry both voice and data traffic. An edge router only requires a single interface, even when multiple virtual circuits are used. Frame Relay creates PVCs which are uniquely identified by a data-link connection identifier (DLCI). The PVCs and DLCIs ensure bidirectional communication between one DTE device to another. Asynchronous Transfer Mode (ATM) technology is capable of transferring voice, video, and data through private and public networks. 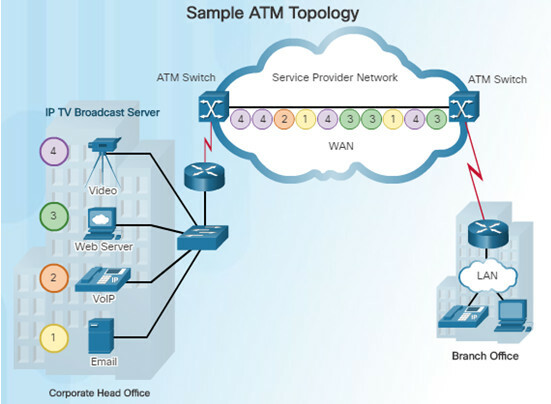 ATM is built on a cell-based architecture rather than on a frame-based architecture. Cells are always a fixed length of 53 bytes. ATM cells contain a 5-byte ATM header followed by 48 bytes of ATM payload. Small fixed-length cells are well-suited for voice and video traffic. A typical ATM line needs almost 20% greater bandwidth than Frame Relay to carry the same volume of network traffic. When the cell is carrying segmented network layer traffic, the overhead is higher since the ATM switch must be able to reassemble the packets at the destination. Thanks to newer Ethernet standards using fiber-optic cables, Ethernet is now a reasonable WAN access option. The original maximum cable length for Ethernet was one kilometer. With fiber-optic cable, the maximum length is 5 km using IEEE 10000Base-LX, and 70 km using IEEE 1000BASE-ZX standards. 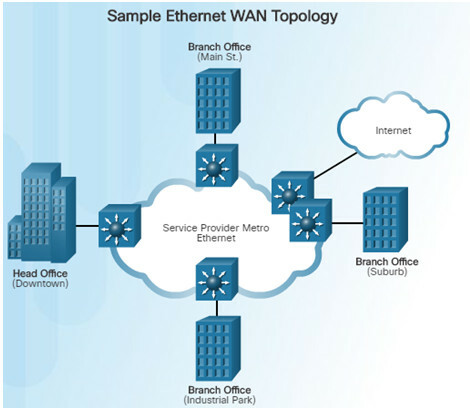 Ethernet WANs are commonly being used to replace Frame Relay and ATM WAN links. Multiprotocol Label Switching (MPLS) is a multiprotocol high-performance WAN technology that directs data from one router to the next. 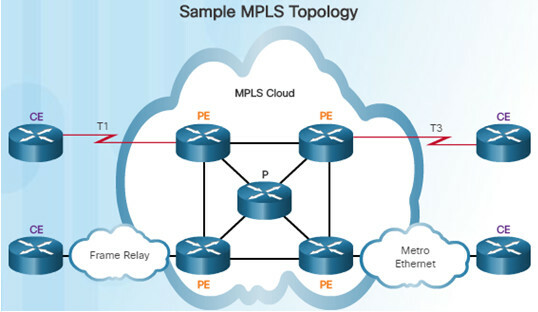 MPLS is based on short path labels rather than IP network addresses. It is called Multiprotocol since it has the ability to carry any payload including IPv4, IPv6, Ethernet, ATM, DSL, and Frame Relay traffic. It uses labels which tell the router what to do with a packet. Notice in the figure to the left that different sites can connect to the MPLS cloud using different access technologies. MPLS can support a wide range of WAN technologies including T-carrier / E-carrier links, Carrier Ethernet, ATM, Frame Relay, and DSL. All private WAN technologies discussed so far used either copper or fiber-optic media. What if an organization needed connectivity in a remote location where there are no service providers that offer WAN service? Very small aperture terminal (VSAT) is a solution that creates a private WAN using satellite communications. A VSAT is a small satellite dish used to create a private WAN that provides connectivity to remote locations. The satellite is in geosynchronous orbit in space. The signals travel approximately 35,786 kilometers to the satellite and back. 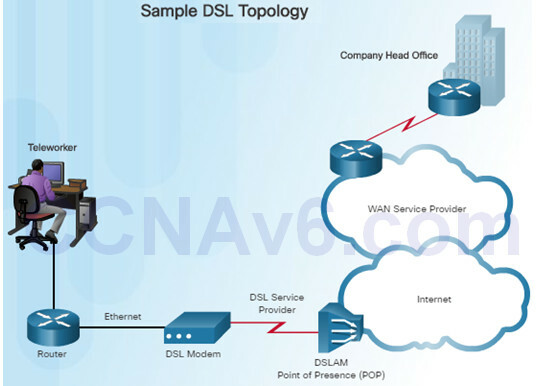 DSL is an always-on connection technology that uses existing twisted-pair telephone lines to transport high-bandwidth data, and provides IP services to subscribers. A DSL modem is required which converts an Ethernet signal from the user device to a DSL signal, which is transmitted to the central office. 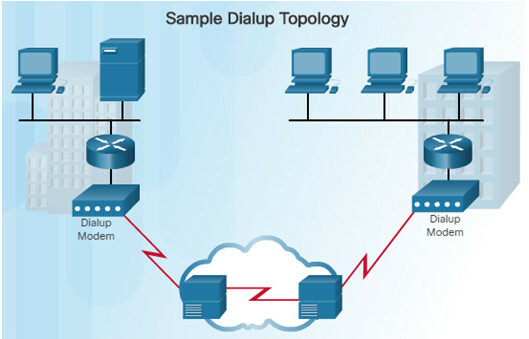 Multiple DSL subscriber lines are multiplexed into a single high-capacity link using a DSLAM at the provider location. DSL is a popular choice for IT departments to support home workers. A subscriber must first connect to an ISP and then an IP connection is made through the Internet to the enterprise network. Network access is available from many cable television providers (using coaxial cable) which allows for greater bandwidth than the conventional telephone local loop. Cable modems provide an always-on connection and a simple installation. A subscriber connects a computer or a LAN router to the cable modem, which translates the digital signals into broadband frequencies used for transmitting on a cable television network. The cable modem termination system (CMTS), which is a component located at the local cable TV office (headend), sends and receives digital cable modem signals on a cable network and is necessary for providing Internet services to subscribers. Municipal Wi-Fi – Many cities have begun setting up municipal wireless networks for free or for substantially less than broadband. WiMAX (IEEE 802.16) – Worldwide Interoperability for Microwave Access (WiMAX) is a new high-speed broadband technology that is just beginning to come into use. WiMAX provides broad coverage similar to a cell phone network rather than through Wi-Fi hotspots. WiMAX operates similar to Wi-Fi, but at higher speeds and over longer distances. 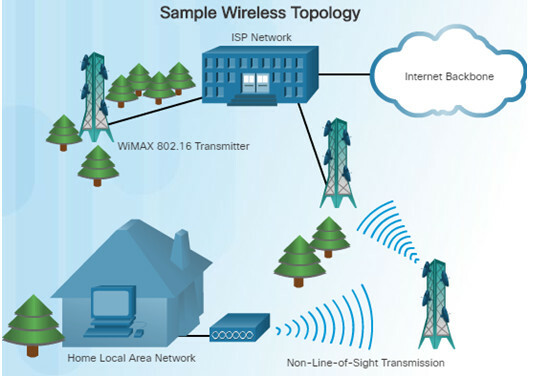 WiMAX uses a network of WiMAX towers that are similar to cell phone towers. Subscribers must be within 30 miles of a tower. Satellite Internet – Typically used by rural users where cable and DSL are not available. 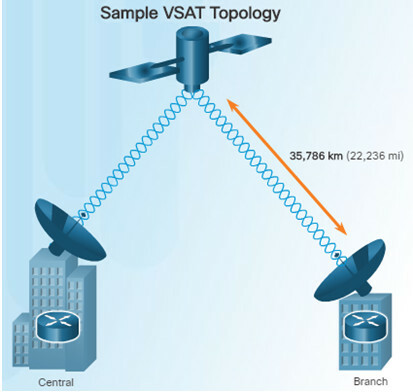 A VSAT provides two-way (upload and download) data communications. The upload speed is about one-tenth of the 500 kb/s download speed. Cable and DSL have higher download speeds, but satellite systems are about 10 times faster than analog modems. Increasingly, cellular service is another wireless WAN technology being used to connect users and remote locations where no other WAN access technology is available. Phones, tablet computers, laptops, and even some routers can communicate through to the Internet using cellular technology. These devices use radio waves to communicate through a nearby mobile phone tower. The device has a small radio antenna, and the provider has a much larger antenna sitting at the top of the tower somewhere within miles of the phone. 3G/4G Wireless – Abbreviation for 3rd and 4th generation cellular access. Long-Term Evolution (LTE) – Refers to a newer and faster technology and is considered to be part of the fourth generation (4G) technology. Due to security risks, VPNs are needed when a teleworker or a remote office uses a broadband service to access the corporate WAN over the Internet. A VPN is an encrypted connection between private networks over a public network, such as the Internet. Instead of using a dedicated Layer 2 connection such as a leased line, a VPN uses virtual connections called VPN tunnels, which are routed through the Internet from the private network of the company to the remote site or employee host. 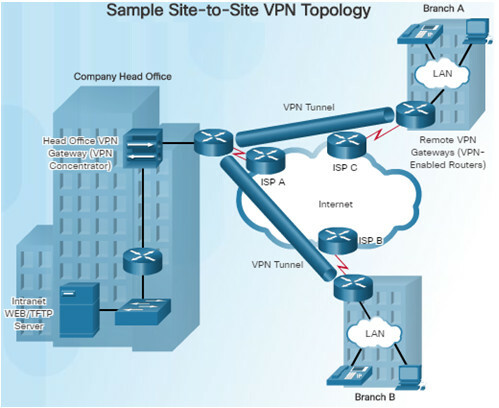 Site-to-site VPNs – Connects entire networks to each other; for example, they can connect a branch office network to a company headquarters network. Remote-access VPNs – Enables telecommuters, mobile users, and extranet consumers to access a company network securely over the Internet. Will the WAN be used to connect internal or external employees or customers? 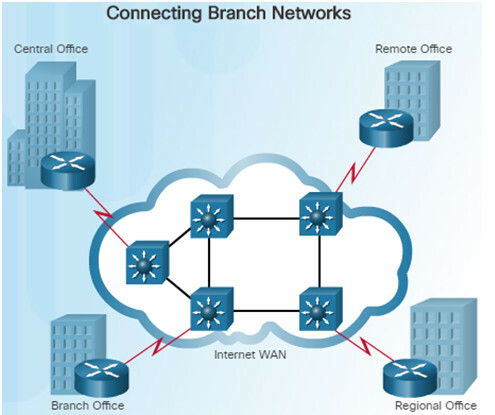 Is the WAN one-to-one (single branch), one-to-many branches, or many-to-many (distributed)? What type of traffic must be supported? What are the quality and performance requirements? What Quality of Service is required? Should the WAN use private or public infrastructure? For a private WAN, should it be dedicated or switched? For a public WAN, what type of VPN access is required? Which connection options are available locally? What are the costs of the connection options available?